The definition of meta is a person or thing that is more than usual or that goes above and beyond. The definition of a witch is a woman thought to be able to cast spells or possess magical powers, or the term connotes evil and can also be used to describe a mean old woman. Therefore, a metawitch is a magical woman who goes above and beyond in her endeavors. This might make her unpopular. Or, as we like to think of it, a metawitch is a woman who thinks for herself, thinks a lot, and doesn’t necessarily follow the rules, no matter who made them. An uppity or difficult woman who looks beyond the surface of a situation to figure out what’s really going on, then talks about what she finds. This is a variation on a traditional Mexican Day of the Dead Calavera Catrina, a skull painted in festive makeup and dressed in finery to celebrate death and life. My icon was created by Kadriya Gatina, Blackspring. You can see more of her art at the link. She does fabulous work in many styles. Dia de los Muertos, or the Day of the Dead, is a multi-day celebration that has its roots in both Aztec culture and Catholicism. In Mexico, the two celebrations combined over the course of time to create this vibrant festival that honors ancestors and accepts death as a part of life. Because the festival has such deep roots, variations on it are celebrated all over the world, and it has become more popular over time. In New Mexico, where I live, Dia de Los Muertos is a multicultural festival that spans more than a month of celebrations. Day of the Dead decorations can be found in stores at any time of year, especially variations on the sugar skull Calaveras. You can find skeletons performing any activity you desire, along with cats, dogs, etc. Brides and grooms are especially popular. We take the “Until death do us part” line in the wedding vows seriously! The history of the female calaveras, often known as Catrinas, is complex. Female calaveras have roots drawn from the Aztec goddess Mictecacihuatl, the Lady of Death. The first direct ancestor of the Catrinas was created in 1912 by Mexican artist José Guadalupe Posada to satirize indigenous women who were wearing heavy makeup and European clothing in order to pass as white. Posada was a well known political satirist and this drawing was typical of his style. 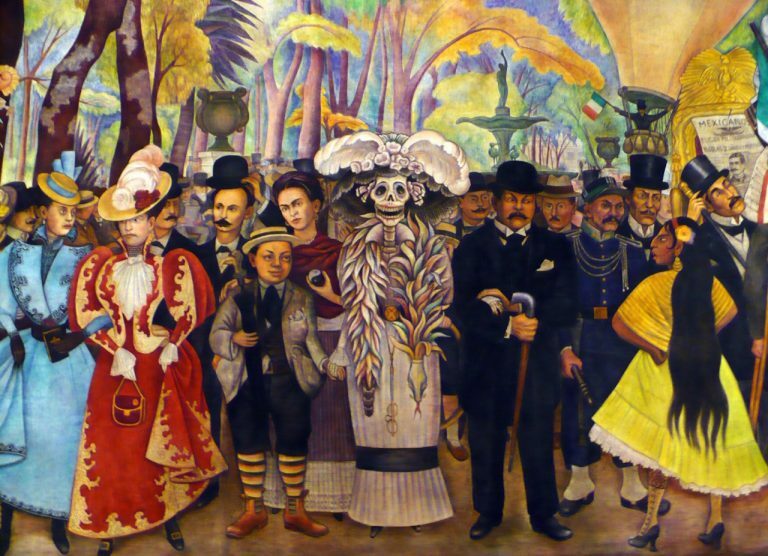 The second Catrina was created by painter Diego Rivera (Frida Kahlo’s husband) in 1947 as part of a mural called “Sueño de una tarde dominical en la Alameda Central” (“Dream of a Sunday Afternoon along Central Alameda”). 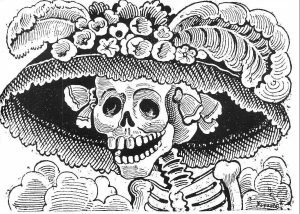 Rivera gave the Calavera Lady a fully clothed body to match her head and hat. He placed her at the center of the mural, standing between a self-portrait and an image of Posada. “And [he] called her La Catrina, the feminine version of the Catrin, a bon vivant dandy in Mexican culture.” (Eluniversal.com). Rivera’s affectionate take on the character provided the name Catrina and is the source of her popularity. There are many meanings for Calaveras and Catrinas, and there have been many types of them. In the 19th century, literary calaveras, in the form of satirical poems, were popular. These were meant to cut the living down to size by reminding them that death is the great equalizer. This is one of the messages of the Calaveras and Catrinas to this day. In the end, we are all equal. No one escapes death. There is no use in fighting it, so why not celebrate, relax and enjoy life? I try to capture this complexity of life in my writing. We all need to relax and have fun, be a little silly and watch mindless entertainment. But what we watch also makes a difference, because it’s big business and because it affects people’s opinions. Because of that, if I see something I think is wrong, I want to point it out, rather than let it stand. I hope that I at least occasionally manage to do so with the grace, humor and affection of the Catrinas. Of course not. We’re both daughters and sisters of men. We’re both romantically involved with men. One of us has a son. But our culture has promoted the needs of men over the needs of women for millennia. Progress has been made in correcting this, but a bias that deeply rooted in a culture won’t disappear in a generation or two. It’s understandable that men feel under attack. They’ve had certain automatic privileges all of their lives. When others begin to catch up, that feels like a loss, even though it’s just fairness kicking in. We’ve encountered many men who have a difficult time with misogyny being pointed out at all. Some refuse to accept that it exists when we point to it, because it’s institutionalized and the accepted way that everyone has always done things. Some women refuse to believe that this type of misogyny exists at all or applies to them. That’s called internalized misogyny. It’s subtle and insidious. An institutionalized or internalized way of thinking doesn’t equate with a just or fair way of thinking. It only means that the person has bought what the power structure is selling them. We have to check each other for ingrained misogynistic thinking all the time, because it’s so ubiquitous. The pressure to go along with it is so intense that we often don’t realize what we’re doing at first. We might only notice because of generational, cultural shifts that make it obvious to one of us, like cultural changes in sexual and dating practices over time. We understand that most men are just going with the societal flow and doing what makes life simplest for them, without thinking through the impact of their actions. But most women aren’t in a position to be honest about how beaten down they feel by the status quo, and they convince themselves that they’re fine, because “go along to get along” is the way we do things in the USA. At Metawitches, we’re too ornery to shut up. Please stop asking us to. We point out unfairness when we see it. Our focus is most often on male-female issues, because that’s what affects us most and what we’re most qualified to speak to, but we look at other issues too. We’re not trying to catch everything or solve everything, just raise awareness. There are so many overused stereotypes out there that we could write about them forever, like the rigid black male sidekick, the smart but ugly female best friend, the dumb but pretty female best friend, the trend toward making background characters diverse and disposable… But we’d rather write about plot and character, and slip these observations in with something more interesting. So, no, the men are not experiencing the same things as the women, in quantity or quality. The creators might want you to think that, and they might even think that themselves, but look closer. The only way our culture will improve is if we expect people to do better.